Leading off today: Juston Johnson's high school basketball season is in the hands of a State Supreme Court justice at the moment, The Buffalo News reported this week. Johnson was third-team all-state in Class A a season ago and led West Seneca West to the Section 6 Class A championship. But as we noted over the weekend, the section has ruled that the star point guard has used up his six years of eligibility. An appeal to a New York State Public High School Athletic Association three-person panel was turned down, leading to a filing in State Supreme Court in Erie County asking for a waiver that would allow Johnson to play this season. The filing contends that having to miss the season would negatively impact Johnson's ability to play college basketball. The Indians open tonight against Canisius, and the player's father told the paper a court ruling is expected Wednesday. That ruling, however, has the potential to be a non-decision. The court system has a history of declining to act on eligibility cases until the athlete has exhausted appeals all the way up the chain to the New York State Education Department. At issue is whether the 2013-14 academic year when Johnson was home schooled after an arm injury should count against his six years. Johnson had played varsity basketball the previous year, triggering his six-year eligibility clock from the start of seventh grade. When he returned to West Seneca West in the fall of 2014, the district re-enrolled him as an eighth-grader, in essence repeating his home-schooled year. The initial Section 6 eligibility ruling this year said West Seneca did not offer sufficient evidence that Johnson would qualify for one of the relatively narrow exemptions under NYSED regulations. Further, the ruling also said that Johnson's father had told sectional Executive Director Timm Slade that the teen would repeat eighth grade in order to get bigger and stronger to excel at basketball. Johnson's father denied that conversation happened, the paper reported. Ex-Sec. 4 runner struck, killed: Binghamton High School graduate Noah Farrelly died Thursday from injuries suffered two days earlier when he was struck by a minivan while jogging at Stony Brook University. Farrelly, 18, was a student at the university and had been in critical condition since being transported to Stony Brook University Hospital. Suffolk County police investigating the incident said Farrelly may have been crossing a street against the traffic light while jogging. Farrelly was an accomplished high school runner. He was the Section 4 champion in the indoor 3,200 meters last winter, the outdoor champ in the spring and a four-time state meet qualifier. He signed a National Letter of Intent to run with Stony Brook in May. Hoops scene heating up: I'm not in full winter sports mode at the moment, but a couple of boys scores in Brooklyn on Thursday confirmed that basketball season is definitely here. Down by five points in the final two minutes, Brooklyn Collegiate rallied to an 86-85 win at Thomas Jefferson on two free throws from Majesty Johnson (20 points). Amahrie Simpkins chipped in with 18 points and Charles Brown chipped in with 15 points and 15 rebounds. Elsewhere, Boys & Girls edged archrival and perennial Brooklyn contender Abraham Lincoln 65-62 as Marcus Patterson finished with 18 points, six rebounds and six assists. Following up: I blogged Wednesday about the Batavia Notre Dame girls basketball team being pushed up a class by Section 5 for the second consecutive season. 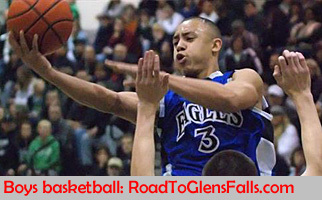 On Thursday, the "Class B" Fighting Irish lost to Class D Elba 54-41. Lawsuit can proceed: The families of three football players whose teammate was killed during an offseason conditioning camp mishap can sue the Sachem Central School District for allegedly failing to provide adequate mental health services to the teens, a judge has ruled. The families had 90 days after the August 2017 death of Joshua Mileto to file a notice of claim but waited until June 2018 to do so. State Supreme Court Justice David Reilly ruled Nov. 30 there were valid reasons for excusing the lateness, including the district's alleged ongoing actions over the past several months, Newsday reported. "Petitioners maintain, in this regard, that Sachem recently began removing several football coaches from the football team," taking away the "last source of mental health therapy" for the teenagers, Reilly wrote. The ruling allows the parents of Matthew Kmiotek, Nicholas Paolucci and Joseph Udaze Jr. to file a $15 million suit accusing the school district of causing severe emotional trauma, partly by failing to provide promised counseling in the aftermath of Mileto, 16, being fatally struck by a 400-pound log being carried by players during a training exercise. The Sachem East Touchdown Club, a booster group associated with the football camp, is also named as a defendant. Getting together: The Westport Central and Elizabethtown-Lewis Central school districts will merge next July 1 following approval by voters in both districts on Tuesday. The schools have already been fielding combined teams in some sports, and the merger will see Section 7 shrink by one school. Even with the graduated scale used to calculate BEDS figures for schools that combine teams, the merged school will remain comfortable in Class D for all sports. The vote was the culmination of more than five years of exploration and planning by Elizabethtown-Lewis to find a merger partner. Extra points: The Elmira Christmas Wrestling Tournament has been renamed the Dave Buck Memorial Tournament in honor of the veteran coach who died last December after battling mesothelioma for two years. The 14-school event begins at 10 a.m. Saturday.